Jacob the candle maker disputing with Brother Cornelis. Jacob was later burned. 1569. Engraving by Jan Luiken in Martyrs' Mirror, v. 2, p. 425 of Dutch edition. Jacob (Jacques) de Rore (also called Jacob de Keers­gieter and Jacob de Kaarsengieter, i.e., chandler or candle maker, his father's trade), an Anabaptist martyr, executed with Herman van Vlekwijk by burning at the stake at Bruges, Belgium on 8 June 1569. Jacob de Rore was a preacher (prob­ably an elder) and one of the most prominent Men­nonite leaders in Flanders. He was born at Kort­rijk (Courtrai) in Flanders in 1532 or 1533 and was a weaver by trade. In 1551 he left the Catholic Church and in 1554 he was one of five persons bap­tized by Gillis van Aken in the forest of Marken near Kortrijk. Soon after, he became a leader in the Kortrijk congregation. When Leenaert Bouwens baptized here in 1557, Jacob de Rore was present. In 1559 he married a member of the congregation at Armentieres; the wedding was performed at Armentieres by Adriaen Termentiers. In 1560 Jacob became a preacher. Up to 1566 he was especially active in the south of Flanders; he preached at Armentieres, Kortrijk, Meenen, Wervik, Poperinge, Roesselare, Ieper, Thielt, Ghent, St. Andries, and Bruges. He per­formed a large number of marriages. In 1566-1568 he mostly lived in Bruges. On 1 February 1567 he attend­ed a conference at Harlingen, Dutch province of Friesland, which was called to settle the Frisian-Flemish schism (see Flemish Mennonites). Jacob de Rore took the side of the Flemish. In 1569 he visited Gelre and the territory of Cleve. In April of the same year, having returned to Bruges with Herman van Vlekwijk, both were ar­rested. 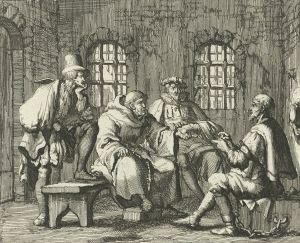 They were severely cross-examined (the Franciscan monk Broer Cornelis was one of the In­quisitors) and tortured. They died steadfast. In prison Jacob de Rore wrote 19 letters. Letters 1, 7, 10, and 14-19 are undated. They are addressed to his wife (Nos. 1, 8, 18), to his children (Nos. 3, 4), to his sister G. F. (Nos. 6, 15, 17), to his brother (No. 9), to his congregation at Bruges or Kortrijk (Nos. 2, 10, 16), to the congregation of Hondschoote (No. 5), to Elder Paulus van Meenen (No. 7), to a brother of the congregation (Nos. 11, 13), to the ministers of the Flemish congregations (No. 12), to the congregation of Armentières (No. 14), to Adriaen Olieux, who was in prison at Armen­tières (No. 19). These 19 letters are found in a book published in 1577 (n.p. ), entitled: In dit teghenwoordighe Boecxken zijn vele schoone ende lieflijcke Brieven van eenen ghenaemt Jacob de Keersmaecker die hy wt zijnder ghevanchenisse ghesonden heejt, etc. There is a reprint of 1584 (n.p.). Of both editions a copy is found in the [[Amsterdam Mennonite Library (Bibliotheek en Archief van de Vereenigde Doopsgezinde Gemeente te Amsterdam)|Mennonite Library at Amsterdam]]. There must also have been an edition of 1571, which has been lost. The book also contains the disputation between Jacob de Rore and Broer Cor­nelis, and two songs: (a) "Aenhoort ghy Christen schaer voorwaer, Hier int openbaer" (Hear, ye host of Christians, here publicly), (b) "Seer minnelijc gegroet zijn moet alle die doet het goet" (Kindly greeted should be all who do the right). These songs are found in Wackernagel, Lieder. The Dutch martyrbooks have inserted a number of these letters of Jacob de Rore. The 1615 edition contains Nos. 1, 2, and 3; the editions of 1617 and 1626 and 1631 Nos. 1, 2, 3, 4, 7, and 12; van Braght's Martyrs' Mirror, editions of 1660 and 1685, both have Nos. 1, 2, 3, 4, 7, 11, and 12. The book of Jacob de Rore was very popular among the Mennonites. Joos de Tollenaere wrote 1589 from prison to his daughter (see Martyrs' Mirror) that after his death her mother should give her the booklet by Jacob de Keersgieter, "because therein are found fine exhortations." Braght, Thieleman J. van. Het Bloedigh Tooneel of Martelaers Spiegel der Doopsgesinde of Weereloose Christenen, Die om 't getuygenis van Jesus haren Salighmaker geleden hebben ende gedood zijn van Christi tijd of tot desen tijd toe. Den Tweeden Druk. Amsterdam: Hieronymus Sweerts, 1685: Part II, 424-437, 452-475, 777. Braght, Thieleman J. van. The Bloody Theatre or Martyrs' Mirror of the Defenseless Christians Who Baptized Only upon Confession of Faith and Who Suffered and Died for the Testimony of Jesus Their Saviour . . . to the Year A.D. 1660. Scottdale, PA: Herald Press, 1951: 371, 774-818, 1080. Available online at: http://www.homecomers.org/mirror/index.htm. Haeghen, Ferdinand van der. Thomas Arnold and R. Vanden Berghe. Bibliographie des Martyrologes Protestants Néerlandais. II. Receuils. The Hague: M. Nijhoff, 1890: I, 305-318. Verheyden, A. L. E. Het Brugsche Martyrologium (12 October 1527-7 Augustus 1573). Brussels, : 58-60, No. 63. Available in full electronic text at: http://www.theologienet.nl/documenten/Verheyden%20Brugse%20Martyrologium.pdf. Wackernagel, Philipp. Lieder der niederlandischen Reformierten aus der Zeit der Verfolgung im 16. Jahrhundert. Frankfurt: Hender & Zimmer, 1867. Reprinted Nieuwkoop: B. de Graaf, 1965: 200-202. Zijpp, Nanne van der. "Jacob de Rore (ca. 1532-1569)." Global Anabaptist Mennonite Encyclopedia Online. 1957. Web. 23 Apr 2019. http://gameo.org/index.php?title=Jacob_de_Rore_(ca._1532-1569)&oldid=148775. Zijpp, Nanne van der. (1957). Jacob de Rore (ca. 1532-1569). Global Anabaptist Mennonite Encyclopedia Online. Retrieved 23 April 2019, from http://gameo.org/index.php?title=Jacob_de_Rore_(ca._1532-1569)&oldid=148775. Adapted by permission of Herald Press, Harrisonburg, Virginia, from Mennonite Encyclopedia, Vol. 3, pp. 62-63. All rights reserved. This page was last modified on 8 June 2017, at 14:46.